And I feel like the "star" and "fish" combining to create "starfish" might be irrelevant, but just a clue as to how to connect the colors and the numbers. I like the immediate implication with respect to the groundhog seeing its shadow. The shadow is the result of an object, groundhog rising up out of a hole, and a light source, the Sun. The Sun is the center of our solar system. I think there's an idea here that might follow if we take the clues in the book to give us indications of a similar implication. 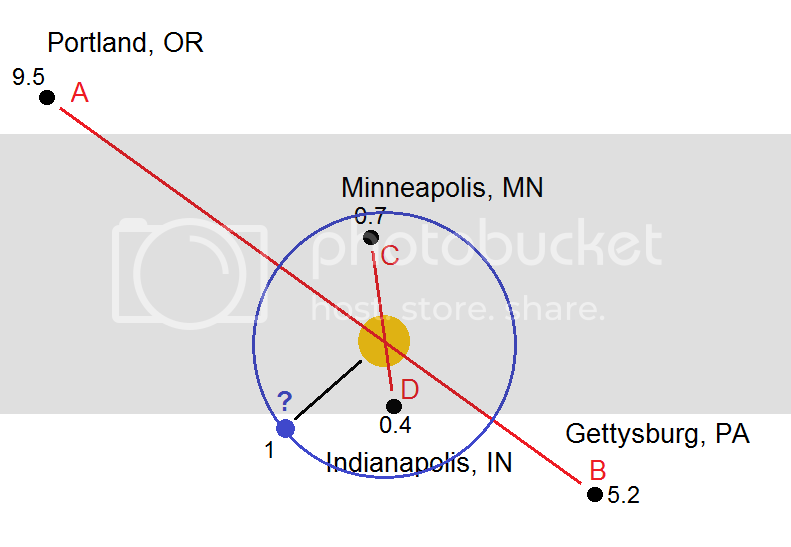 The four cities that give us a cross points us to a center (Sun). The next task may be to find the "groundhog's hole". I'm curious, what are the relative distances of each of the four cities from this center? If they match the same relative distances as planets in our solar system, which planets could they be and if none fit the relative distance that would be Earth, maybe we're able to generate an actual distance from that central point, thereby bringing into consideration a new city or location. I took a moment to look at a map and compare distances as if each of the four cities were scaled as some planet in orbit around the Sun. Lets see if anyone else comes to the same conclusion: Indianapolis = Mars, Minneapolis = Jupiter, Gettysburg = Saturn, and Portland = Neptune. If we assume the groundhogs hole is Earth, then we're looking for a spot about 100 miles from the center of these four cities. After a more accurate analysis Ive found theres considerable error in using a solar system overlay on the mapping. Wasnt a bad idea though. Anyway, enough with that idea, it probably isn't what's going on in the Whistle Pig puzzle. I was reading the origin of the word WHIG as old Scottish to mean "horse thief" or "horse drover". I think that the picture you drew selects the state for the second set of 4 cities. yeah, that's probably right. I just liked the planets distance idea so much I wanted to share. Also, it's not going to be easy to implement without having some considerable error since it would require the city selection to be ideal distances.